I don't have a lot of use for doilies really. Every surface in my home except chairs seems to have books on it. Books decorate my home like knick knacks, paperbacks, hardbacks, vintage craft books, novels and more outdated unabridged dictionaries than anyone should have (which come in very handy for pressing flowers). Pretty lace bookmarks sure, but doilies, not so much. I love making doilies though. I wind up giving a lot of them away to friends. Other than that, I also make bun holders and pretty lacy cozies for my nano which I get a lot of compliments on at the gym. I picked up some size 10 thread and some macramé type brass rings at a local thrift store, and while I was watching tv this weekend with my husband, I decided they would work nicely for doilies made to fit to hang my earrings from. I'm awfully happy with how they turned out but I didn't keep notes while I was working. I think using any doily pattern you like would work. Just follow the pattern until it's just shy of fitting in the ring, then attach it with crochet to the ring at regular intervals and add a loop for hanging. I don't use patterns for doilies. Working out the geometry and math for one while I'm crocheting is fun. 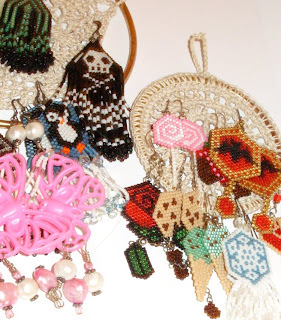 The patterns for skulls, penguins, roses and snowflakes are all available for free at Beadwork at BellaOnline, the chocolate covered strawberries, lollipops and ice cream cone patterns are part of a set you can buy at my Etsy store. The holidays were fantastic. The teens loved their ipods, everyone ate well. Dad was happy with his present because all we got him was lots and lots of chocolate and cookies. Mike got me a new office chair with a built in massager. It feels good. I threatened to move into my office because it's so comfortable.